Most playdough recipes include cream of tartar. In case you don’t have cream of tartar, feel free to check out our non-cream of tartar playdough recipe, it’s really good too. You probably haven’t found a playdough recipe that isn’t on our site, we probably have them all. Place all of the ingredients in a medium size or large pan. Cook slowly on medium-high and stir it until the playdough thickens. Thought there would be more steps? Nope, we keep it simple. Keep the finished playdough in a plastic container in the fridge, that way it lasts alot longer. This playdough recipe is similar to the traditional playdough recipe, make sure to take a look at that playdough recipe too. This recipe takes less than 10 minutes, giving you more time to enjoying the finished playdough. Here’s your salvation, our extended step-by-step explanation on how to make cream of tartar playdough recipe. We’ve even included images. You will succeed with our help! Ok, so I managed to gather the ingredients needed. We have the cream of tartar, flour, salt, colored water and oil. Let’s get going. Pour all the ingredients into a pan. Depending on the food coloring you go for, it should look like this. 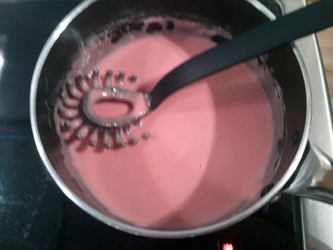 With the amount of color I added to the water it’s more pink than red, so don’t be afraid to use some food coloring. 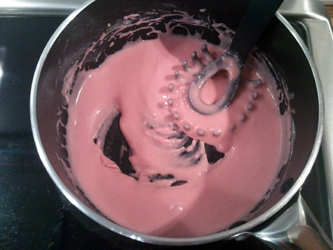 The color of the end result becomes more visible after we’ve mixed the ingredients more thorough. If unhappy with the color, this is the time to add more. After heating the mixture for a few minutes it will start to become more and more doughy. The image below shows the beginning of a doughy texture. The homemade playdough will be finished 1-2 minutes after it reaches this point. 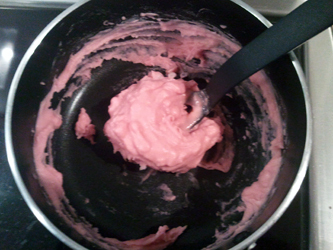 Here you can see how it should look in the pan when the playdough is finished. Remove it from the heat and start collecting the playdough. Remember that it’s still hot. Ok, the cream of tartar playdough is done. Finished and rolled into small balls, it looks like this. This playdough recipe contains salt and will dry out your hands. Remember to use some lotion after handling the playdough. This recipe works great, I’ve tried it several times, recommended! This is a great recipe. I use it to make modelling materials for class and the kids love it! My kids ran fresh out of name brand. I made this is like five minutes! Thanks. So I used half the recipe and ended up with a dry lumpy mess, that caked on instantly. I added more water and now have four lumps and sticky stuff that hopefully will cook down. Could it be that the ratio is not quite right and more water is needed per cup of flour? I’ve tried the recipe several times myself and never had any problems with it. The images for the extended explanation is about half the amount of the recipe too. You’re using standard flour and salt? If it’s sticky and lumpy adding more water should help, it probably just takes a bit longer to boil it down to playdough. I used kosher salt (that’s all I had) and it turned into a lumpy sticky mess that stuck to my pot.. could hte salt be the problem? I’ve used the recipe 2x now, both times with Kosher salt and it worked great! The first time I used a high gluten bread machine flour and it was the best playdough I’ve ever had. But that type of flour was expensive so the next time I used regular cheap white flour. It still worked well but wasn’t quite as elastic. Making some more today on a play date! Nansi, perhaps the pot is the problem? Is it a “non-stick” pot or an older one? I forgot how long this recipe is good for? I keep my playdough in tupperware. One person told me to throw the playdough away after a month is that right? I would say that it’s good as long as it’s working and doesn’t smell. I love it a lot. Only problem is the smell stinks badly but after when I put the playdough in the fridge the smell was not as strong. Try putting in a teaspoon full of vanilla, it will get rid of the bad smell! Try adding a dash of cinnamon or peppermint oil! I always use this recipe. I add kool-aid mix to the water instead of food coloring, this adds a nice smell. Also, once the cooking is done, turn out the ball of dough and knead it like bread dough for about 3 to 5 minutes, until it’s really smooth; I find this helps with the texture a great deal. I just leave it in a plastic bin on the play table, rather than in the fridge, and pitch it once it gets dry. Usually I forget to put it away once or twice, and after the third time sitting out all nite it finally drys out enough that I can justify pitching it! Thank you for your input. I’ve never had any problems either. It should work very well and last long if stored correctly. I just “dig” into the flour package and scoop it out. It’s loosely packed measures. Easy to make! How long does it stay good for? If you store it in an airtight container in the fridge, I would say a few weeks. Throw it away it starts smelling or it loses it’s doughy texture. Which type of oil do you use? Is vegetable oil ok? One better than another? I use standard vegetable oil, I haven’t tried anything else. I love this recipe. For the smell you can add an extract (e.g. vanilla, coconut, almond) but then the kids think it tastes good. They learn quickly that it does not. I have kept the same batch of this recipe for months at a time and it worked great. My 5th grade class loved it! 🙂 I have tried this recipe minus the cream of tartar. It works, but separates eventually. Nice! The old classic problem with tasty looking and (in your case) smelling playdough never gets old 😉 Thanks for letting us know that it can keep well for long. This recipe was easy and fun for the kids to help make. Tip: if play dough starts to dry out or get that dry/salty texture, just rub a little veg oil on it and knead it in. I use this recipe for my preschool students. I do not refrigerate it. I do keep it in airtight containers. I try to make a new batch at least every month but it has lasted for at least two months with no problems. Today I tried to make a double batch, and I would not recommend doing that. Stirring at the end of the cooking time was challenging. I always knead it following the cooking. In the past I have always added the food coloring during the kneading process. 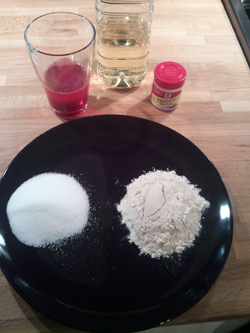 It was much less messy following this recipe and adding it into the water. I have also left it plain colored and added glitter. Fun and sparkly! Works great! I use vanilla estract to smell nice and mine lasted over 6 months in a normal freezer bag stored in a cupboard. It just went in the bin ’cause too dry. 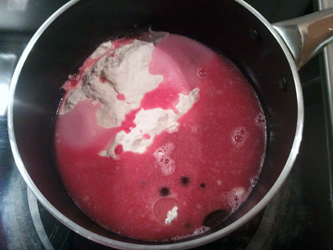 If u want more colours just mix the ingridients witthout food coloirung and add it when move from the saucepan (when it is still hot divide in 2-3 balls and add the colouring, use gloves). Pour all ingredients together & stir. Stir constantly. After a few mins it will form a clump. Remove from heat & knead by hand. I have done this recipe with table salt and then once with kosher flake salt. My kosher salt recipe was weird. I recommend table salt. The geek in me thinks it’s the grain size of the kosher. You may very well be correct. I’ve previously heard of problems with kosher salt when making playdough. This recipe was super sticky. Do not recommend! Really? Never had that problem. It was a rainy day and I was in a pinch to occupy my toddler for the hour before bed and this did the trick! My husband made it while our daughter and I watched over his shoulder and it only took 5 minutes!! Lots of fun… thanks for posting. Worked like a charm! Thanks!! I wanted a reasonable amount of playdough and had lost my old tried and tested recipe. This seemed most like the one I remembered so have given it a try! Made 2 batches – blue and yellow and will take it to school tomorrow to test it out! will report back! many thanks for all the recipes! Help! I’ve made quite a few attempts at this and it always starts off great. We use it once a week at a tots group but after a week or two it goes sticky. It’s stored in an airtight box. Anyone got any ideas? Many thanks! The dough absorbs moisture from the humidity in the air. We were boiling water one day and found our dough became soggy even though it was sealed in a plastic container. We added more flour and it was fine. In fact the kids loved kneading the dough with flour. The first time I made this recipe I used just a smidgen more than half a cup of salt. It turned out wonderful! Then I made it again but this time I used a different type of salt. The fist time I used kosher course sea salt, that’s what I cook with and all I had on hand. The second time I used regular table salt. Boy does it make a difference! The first batch was smooth and easy to play with (kosher sea salt dissolves completely) and the second batch really dried my hands out quickly and was grainy. My daughter loved playing with them anyway. Great, thank you for your tips! 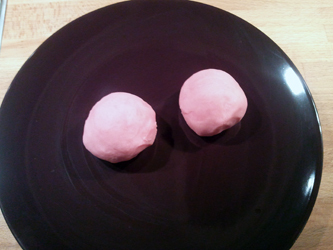 I have tried many different playdough cooked none cooked but nothing like this one. My son and I made this one this morning. He abs LOVEs it. I did how ever didn’t have regular oil so I subed it with extra spray oil. It’s great no problems! Going to make this everytime now! So far works perfect, not that sticky. I think my siblings will love it. This recipe is perfect. Thanks a lot for posting it. Loved this recipe! Came out very well and was so quick to make! Thanks! Mine seemed great right after I made it, but then several hours later (when I was trying to show it off to my husband before surprising my kids with it the next morning) it was super sticky. Any solutions anyone? I still would like to have playdough for the kids in the morning, but this won’t work as it is now. So, I’m pretty much completely inept in the kitchen, but with these instructions even I was able to make some pretty good play dough! My kids and I used some mint tea bags in the water before we mixed everything together and it smells fine. Not that I’m going to use it for potpourri or anything, but it’s inoffensive. Thanks for the great recipe and instructions, and thanks to all the comments for great pointers! I forgot to add the cream of tartar! Can I knead it in now? Hate to throw it away. It was a quadruple batch and I need it for class tomorrow. HALF of this recipe makes a little under a pint. Old Talenti jars work great ( and fit the half recipe) bc of the screw on lid! Love this recipe – made it many times now. Just be sure to cook completely or it ends up sticky and goes bad much faster. Otherwise we’ve had some batches last – not in fridge even – 6 months and going. We always use baby oil instead of veg and it smells great. Plus who doesn’t have some left over from the baby shower still. It looks lumpy when it first comes out of pan but kneading for a few minutes gets it smooth. Since I am not using with children could I substitute pain for food coloring? I love this receipe. I have been making homemade play doh for the last 7 years. I have also been making it for my youngest preschool. They love it over the store brought playdoh. They told me that once he goes to big boy school that I will still be making there playdoh.